What can we do to combat discrimination against people with vitiligo? Perhaps you have never been discriminated against because of vitiligo. Perhaps you have been ignored or mistreated but simply overlooked the issue. Perhaps you have been mistreated, bullied, or made to feel less than. What do we do about it? What can we do in the face of ignorance and a culture of perfection? How can we, as people with vitiligo, as people that love and support others with vitiligo change the conversation on vitiligo and lift up those that are suffering? Thinking again about Rep. Parren Mitchell and his work to support vitiligo with federal dollars for research, it occurs to me that few of us are in a position of power to do as he did. Few of us are in Congress and few of us even know a congressperson. Together and individually we are capable of changing the world’s perspective on vitiligo. Together and individually we are capable of changing the world’s perspective on beauty. Together and individually we are capable of changing the world’s perspective on disease. Where do we go for examples? What’s the first step? Thankfully we are not alone in this. We look around and see examples of courage and compassion that guide us on our way. As perhaps all of us know, Michael Jackson suffered from vitiligo. There is a strange conversation about this as some accuse Michael of lying. As if the sharing about his struggle with a skin disease is a mask for a secret to desire to be something other than Black. As if vitiligo were a fake tale of suffering hiding an unexplained desire to be someone other than himself. This is the mean, ignorant and frankly, racist conversation. And Michael chose to speak his truth on an international stage with an interview with Oprah. Michael : Okay, but number one, this is the situation. I have a skin disorder that destroys the pigmentation of the skin, it’s something that I cannot help. Okay. But when people make up stories that I don’t want to be who I am it hurts me. It’s amazing to me that people continue to make up stories to explain a simple disease. That aside, there is a simple lesson on dealing with discrimination that we can learn from Michael Jackson: Speaking the truth in the face of discrimination is powerful and changes how people see us. How many of us with vitiligo are grateful to Michael for opening up a national conversation on vitiligo that allows for us to quickly explain the disease and to quickly and simple communicate the complex issues we face? This is something we can all do. When someone asks us about our skin, it’s an imposition. It may come from a genuine place of concern, and still it’s an imposition. No one has the right to demand of me that I reveal to them my personal medical history. That is private. Whatever you decide to share is your personal business. What you share about vitiligo is a kindness you are showing others. It’s a privilege to share and to be listen. Sharing our story is caring. Ogo Maduewesi, my friend in Nigeria, provides us with another example of courage and practical support for vitiligo. Having vitiligo in Nigeria and other African countries is an entirely different experience than in coutries like USA, UK, Canada. There is less awareness about skin disease and higher visibility of the disease. It’s harder to hide and harder to explain. More judgement and discrimination is the result. She speaks the truth about the disease and she makes herself available to people that are suffering from discrimination and fear because of vitiligo. She has built an organization, Vitiligo Support and Awareness Foundation around her desire to spread awareness in West Africa. She reaches thousands of people with her message of courage, information and hope. …there was one overzealous man whom after staring at me for a while walked up to me rubbing my face and asking with very annoying laugh, what is this little girl? I was so surprised, embarrassed, insulted and amazed that I asked him: “do you have to touch me to ask that.” …he went on asking why he can’t touch… someone asked me to try bleaching my skin and now left with white patches and that brought about serious laugh from everybody in there. At this time I had lost it, I was so humiliated and embarrassed, couldn’t hold it and was already crying and was ready for the worst, he went on having fun humiliating me, but at the time I had told him that if he dare touches me again that I will blow him. He advanced towards me again to touch me, but for the intervention of a woman in there who’s been watching all the while, I left there very sad and in tears. Another time I felt so humiliated was the day a girl who got into the commercial bus I was already seated looked up and seeing my face (peak of my Vitiligo) screamed and the driver of the bus stopped and she jumped down from the bus. Every other person now started looking at me as if I had some contagious deadly disease; I tried ignoring their stares but was dying deep inside. We can only imagine how these experiences would shape each of us. 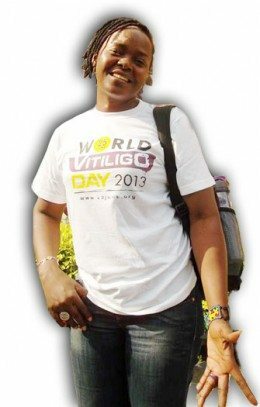 For Ogo, she decided to fight and she decided to love those that mistreat her and educate them as much as she is able. Do all of us need to start an organization? Do we need to be interviewed on TV? Of course not. But we can do as Michael did: Tell the truth to those that ask and deserve our truth. We can also do as Ogo does: Loving share our stories with each other supporting other with vitiligo along the way. These two things, we can do, together and individually. On my Facebook page, (http://facebook.com/ihavevitiligo) and on this website, people share their stories, post their pictures and in doing so, change the conversation around vitiligo. It’s easy to think that by hiding vitiligo, our lives are simpler. Its natural to think that by avoiding conversations about our imperfections, our lives are simpler. What I have found, through this website and in my life, is this: talking about vitiligo is very important if we want to stop worrying about vitiligo. Sharing our fears about vitiligo is very important if we want to overcome those fears. Additionally we can learn a couple things from the young Chantelle Winnie, aka, Winnie Harlow. At a young age she pursued a career as a model, allowing herself and the vitiligo on her skin to be seen, really seen. While few of us will be models, I don’t aspire for that work myself, we can learn from her example of confidence. Her confidence, coupled with a beautiful face and frame, presents something quite different than many other models. Her confidence is key. I recall some of her first modelling work before America’s NExt Top model discovered her. Her posture, her walk, her tone of voice all communicated a confidence and comfort in her own skin. This is what you see in her pictures: A defiant invitation to see her, not her disease. These are things we can do as well. Instagram is one place where we can see the effects of Winnie Harlow and her work. People are posting pictures of themselves with hashtags such as: #vitiligo, #vitiligonation and others. That sharing of imperfection is courageous. We support this and we can also do this. Hiding from the camera is understandable. But using the camera as a tool to make space for others is one simple way we can fight discrimination. It’s a defiant action that changes the conversation. It’s a courageous way to bring out of the shadows our fears and insecurities and turn them into strengths that others are encouraged by. Most people get vitiligo between the ages of 10 and 30. These are critical years, formative years. These are the people most affected by vitiligo. Please tell your truth in the comments, post your picture on facebook and tell the truth about vitiligo. What else can we do? Would love to hear your thoughts in the comments! WE VITILIGOANS ARE HUMAN, HARDWORKING, HONEST, GOD FEARING, WORSHIPING , TAX PAYING, FUNNY, LOVING, CREATIVE, TALENTED PEOPLE WITH AN OUTSIDE BLEMISH VISIBLE TO THE WORLD. WHAT IS YOUR BLEMISH, HATRED, RACISM, ABUSIVENESS, ETC. THOSE ATTRIBUTES ARE NOT VISIBLE UNTIL YOU SHOW US AND YOU ARE ACCEPTED AND VALUED. WE DON’T WANT ANYTHING BUT TO BE SEEN PAST OUR ART OF SKIN. hello! i just now found out about this website and i think it’s amazing! I hope you keep writing! I have a blog about this too because i want people to know more about vitiligo, i aslo want to get to know more about it and people who have it! Very nice site. Really inspiring. My heart goes out to Michael Jackson and the world that misunderstood his vitiligo and accused him of all sorts of things. Winnie Harlow…atleast spell her name right.